You are here: Home > News > Seacoast Cottage Shines Light on Cuts to Historic Environment Funding. This B1 Listed thatched cottage is one of over 500 buildings currently recorded to be ‘at risk’. In early 2015, structural issues combined with extreme weather caused partial collapse of the thatched roof. As a consequence the cottage has been deemed structurally unsound and at risk of complete collapse. One of only approximately 150 thatched buildings remaining in Northern Ireland, this six-bay, basalt built, marram thatched cottage survives as a family home, having been in the family of the current owner for four generations. 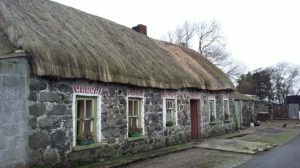 Until 2015, the current owner had self- maintained the thatch without requests for grant assistance. However, the collapse of the thatched roof has meant that the family now need urgent help, and the case is deemed critical. For more than 3 years UAHS has worked with the family at Seacoast Cottage, near, Magilligan, Co. ‘Derry- Edward and Eileen Quigley, who own the listed building and their nephew, Mark Canning. UAHS works in partnership with the Department for Communities, Historic Environment Division to maintain the Built Heritage at Risk Register for Northern Ireland (BHARNI). In Northern Ireland it is not unusual for the legislation for listing, and the resulting designations to be held responsible for situations similar to that which this building and its inhabitants are now facing. UAHS is supportive of listed designations, having lobbied for their introduction, and therefore maintain that the listing is there to protect the importance of the building and its architectural and historical significance. In accepting this, it is not the designation to blame, but the fact that there is nowhere near sufficient resource available to assist owners to repair and restore their buildings, addressing the effects of ‘heritage deficit’, known to face this and other buildings across NI. Until 2014, Historic Building Grants were made available by the then Department of the Environment, (DoE), now the Department for Communities Historic Environment Division. The total sum available then was in the order of £4-5m, modest in terms of the overall NI budget, and in view of the generally acknowledged value of the accrued benefit to NI PLC. Suspension of these grants in February 2015, in response to economic pressures on DOE, was a huge blow to listed building owners. Grants that were particularly important for private owners who cannot avail of other means of assistance, such as Heritage Lottery Funding. In 2016-17, the Historic Environment Fund renewed assistance to historic building owners. However, a total departmental allocation of approximately £500,000 was a significant reduction from over £4m in 2014. An offer of £50,000 for Seacoast Cottage, one tenth of the total Departmental grant budget, could not be drawn down in 2016-17 as it could not cover the costs of restoration or meet the required timescale. Although other streams of non- heritage linked funding have been secured to provide modern services to this cottage, this work cannot be undertaken until the building has been stabilised by works to the rear wall, roof structure and thatch. In response to the real and immediate threat faced by this building, UAHS have recently worked with the owners and qualified conservation practitioners to try to identify a solution to secure the building. So far combined efforts have raised just over £3000. Visit the related fundraising page here. It is ironic that in Northern Ireland, where so much political capital is made of the culture and traditions of communities, that the most durable and visible markers of culture and tradition, our historic buildings, from the most modest agricultural cottages, like Seacoast, to the mills and factories where previous generations earned a living, receive so little recognition from the NI Executive. 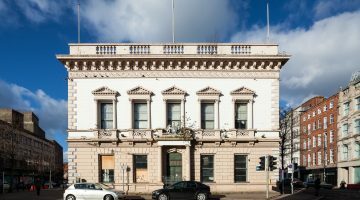 Numerous studies over many years have identified our historic building stock as a key component of Northern Ireland’s Unique Selling Point and an important visitor draw, but it seems that the NI Executive pays only lip-service to actually promoting and protecting the asset. UAHS calls for the level of funding to the historic environment to be reinstated and increased, providing much needed support to owners of listed buildings and to those who wish to acquire these buildings and help to protect them for future generations to experience, enjoy and learn from. Without better support for listed building owners, many more of Northern Ireland’s historic buildings will be lost. Listen to UAHS interview on the issue here from 14.30 mins.